A convenient place to keep small tools when working on the roofs of tank cars and hopper cars. 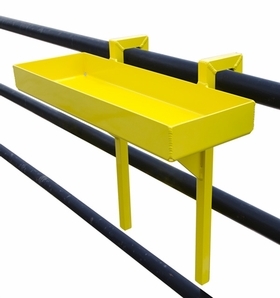 Tray legs fit up to 2" diameter railings on landing platforms and gangways. Welded aluminum with durable yellow powder coat finish. drain holes in each corner. • Tray: 24" x 8" x 2-3/4". Legs: 22" high.